Do you have a dog that had a dull faded coat? We can help. 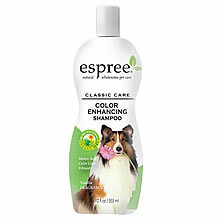 Our Color Enhancing shampoo has natural optical brighteners that remove dirt and stubborn stains to restores your pet's coat back to it's original coloring. Return your pet's coat back to its original luster. An aloe based shampoo that cleans thoroughly and is gentle to the coat. Provides rich suds without robbing the coat and skin of natural essential oils, contains no artificial colors, detergents or harmful coat drying agents. Aloe, Coconut Oils, Panthenol, Jojoba, Vitamins A, D and E are carefully blended to improve the condition of the coat. Chamomile, Calendula and Natural Herbs have been added to enhance the overall color and luster.